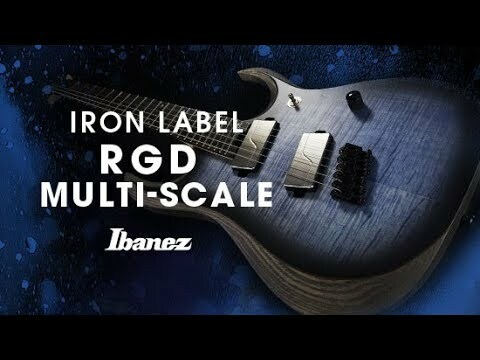 The Ibanez 2018 RGDIM6FM Iron Label Electric Guitar in Cerulean Blue Burst Flat is a multi-scale model that is designed to improve tonal performance, playing comfort, and uphold string tension with greater consistency. Whether you're new to the guitar or are a seasoned pro, you'll be won over by the multi-scale fingerboard layout. The 2018 RGDIM6FM is shaped to the RG body profile we've all come to know and love, a born performer that is perfect for those who like to play fast and fearlessly. The slender body depth allows couples with the ergonomically designed curves to establish a figure-hugging feel that makes you feel like it was made just for you. The body is crafted using a unique combination comprised of a mahogany back, ash middle, and a flamed maple top. The result is a deftly balanced tonal palette that offers the best of everything - a present yet subtle low-end, a forthright mid-range energy, and a sparkling high-end -, allowing you to explore a vast universe of tonal delights. The mesmerising cerulean blue burst finish is as visually captivating as the guitar is aurally satisfying. The RGDIM6FM features a three-piece maple/purpleheart neck, which is as stable as they come. Shaped to the Nitro Wizard profile, the neck sits sweetly in the crook of your hand. The multi-scale design means that each string's scale length is designed to maximise the potential of each one with regard to resonance, sustain, and tone - from 26.7-inches at the 6th string to 25.5-inches at the 1st string. The jumbo frets' markers are angled to guarantee accuracy as you move up and down the neck and switch from string to string. There are white split off-set dot position inlays to guide your way along the fingerboard, as well as luminescent side dot inlays for the darkest of stages. The Ibanez RGDIM6FM is equipped with a pair of Fishman Fluence Modern ceramic humbuckers, which deliver exceptionally smooth tones. From rumbling low-end intensity to searing high-end energy, the Fishman Fluence pickups cut through any mix. The addition of a Fishman Fluence Voice Changing switch on the volume control (push/pull) enables the tonal palette afforded by the unique tonewood combination and multi-scale design to be pushed to its limit. The Ibanez 2018 RGDIM6FM Iron Label Electric Guitar in Cerulean Blue Burst Flat is home to a mono-rail bridge, which is angled to accommodate the multi-scale string lengths. Providing an appropriate anchor point for each string, the bridge ensures that intonation and sustain is upheld with unfailing precision. The headstock is home to Ibanez tuning machines, which keep your strings in tune and ready for action no matter how much you bend them.